The tour is delivered by a professional guide. The group is transferred by a comfortable bus according to the program. 1st day – Arrival at Istanbul. Transfer to hotel, accomodation. Free time. 2nd day – Breakfast. Istanbul city tour, including visits to the Hippodrome square, the Blue Mosque, Hagia Sophia, Suleymaniye Mosque and Beylerbeyi Palace. Departure to Bursa. A visit to Iznik on the way. Iznik, a little town on the coast of a wonderful lake of Askania, is well-known for the first Ecumenical Council that took place here in 325 AD. The Council of Nicaea was historically significant because it was the first effort to attain consensus in the church through an assembly representing all of Christendom. It was the first occasion for the development of technical Christology. This town even served as the temporary capitol of the Byzantine Empire when Constantinople was captured by the Latins. The centre of the town, still surrounded by Roman and Byzantine walls, is remarkable for the St Sophia Temple ruines remaining since those times. Arrival at Bursa, accomodation at hotel. Dinner. 3rd day – City tour. Bursa was the first capital of the Ottoman Empire. The program includes are visits to the tomb of the first Ottoman Emperors, the Green Mosque, the Green Mausoleum, and the Ulu Mosque (the Great Mosque). 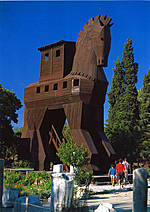 Departure to Canakkale (once known as Troy). Accomodation at hotel. Dinner. 4th day – Departture to Troy. Open air-museum. Departure to Istanbul. Transfer to the airport. Flight. *** Upon request, your stay in Istanbul may be extended.